Murine Ly-49D augments NK cell function upon recognition of target cells expressing H-2Dd. Ly-49D activation is mediated by the immunoreceptor tyrosine-based activation motif-containing signaling moiety Dap-12. In this report we demonstrate that Ly-49D receptor ligation can lead to the rapid and potent secretion of IFN-γ. Cytokine secretion can be induced from Ly-49D+ NK cells after receptor ligation with Ab or after interaction with target cells expressing their H-2Dd ligand. Consistent with the dominant inhibitory function of Ly-49G, NK cells coexpressing Ly-49D and Ly-49G show a profound reduction in IFN-γ secretion after interaction with targets expressing their common ligand, H-2Dd. Importantly, we are able to demonstrate for the first time that effector/target cell interactions using Ly-49D+ NK cells and H-2Dd targets result in the rapid phosphorylation of Dap-12. However, Dap-12 is not phosphorylated when Ly-49D+ NK cells coexpress the inhibitory receptor, Ly-49G. These studies are novel in describing Ly-49 activation vs inhibition, where two Ly-49 receptors recognize the same class I ligand, with the dominant inhibitory receptor down-regulating phosphorylation of Dap-12, cytokine secretion, and cytotoxicity in NK cells. Recent investigation into the function of NK cells has focused on the receptors that regulate the cytolytic function of these cells. In both the human and murine systems, receptors have been identified that inhibit or activate the lytic properties of NK cells. Killer cell inhibitory receptors (KIR)3 or killer cell-activating receptors (KAR) in the human system are Ig superfamily glycoproteins that display a functional dichotomy due to differences in the lengths of their cytoplasmic tails (1, 2). The KIRs contain ITIMs (immunoreceptor tyrosine inhibitory motifs) that upon phosphorylation recruit the phosphatase Src homology 2 phosphatase 1 (SHP-1) and down-regulate the lytic function of NK cells (3). However, the KAR glycoproteins have truncated cytoplasmic regions that do not contain ITIMs (1), but these receptors contain a lysine residue in their transmembrane domain that allows them to associate with the signaling moiety, Dap-12 (4). Following receptor ligation, KAR-associated Dap-12 becomes phosphorylated on tyrosine residues, leading to downstream signaling events that may affect lytic function. The ligands for the KIR/KAR glycoproteins have been identified as the class I molecules HLA-A, -B, and -C (5, 6). In the murine NK system, receptors have been identified that have functional correlates to the human KIR/KAR complexes but belong to an unrelated gene family. The murine Ly-49 gene family consists of up to 14 (Ly-49A-M) type II transmembrane glycoproteins (7, 8, 9). Most of the functional data on this gene family are derived from the study of the inhibitory receptors Ly-49A, -C, and -G2. These receptors have been shown to recognize class I MHC proteins and contain ITIMs that become phosphorylated and recruit SHP-1 upon receptor ligation (10, 11, 12, 13, 14). The SHP-1 phosphatase is believed to dephosphorylate activation-associated tyrosine phosphoproteins and therefore suppress the downstream lytic events mediated by NK cells. Our most recent studies have been aimed at characterizing murine Ly-49D. This receptor has been shown to have a cytoplasmic domain lacking an ITIM and a transmembrane domain containing an arginine, reminiscent of the human KARs (transmembrane lysine residues). Ly-49D ligation using mAb 12A8 is capable of transmitting a positive signal in NK cells that allows them to lyse FcR+ target cells in a process called reverse Ab-dependent cellular cytotoxicity (RADCC), or redirected lysis (15). Furthermore, activated Ly-49D associates with a phosphorylated signaling protein (pp16) that represents phosphorylated murine Dap-12 (16). Biochemical analysis of NK cells following Ly-49D ligation has demonstrated that phosphorylation of Dap-12 leads to recruitment of the protein tyrosine kinase Syk, and subsequent phosphorylation of Cbl, phospholipase Cγ, and mitogen-activated protein kinase (17). Ly-49D-mediated activation also results in the mobilization of intracellular Ca2+, an event characteristic of ligation of other surface receptors, such as the TCR and FcR. Several lines of evidence suggest that Ly-49D recognizes the class I ligand, H-2Dd. Mice depleted of Ly-49D+ NK cells are not capable of rejecting H-2d bone marrow allografts (18), RNK cells transfected with Ly-49D preferentially lyse H-2Dd transfected targets (19), and Ly-49D+ NK cells from B6 mice have been shown to preferentially lyse Con A blasts from H-2d mice (20). The current study addresses several remaining questions regarding Ly-49D activation. Since IFN-γ is a potent mediator of immune regulation, we tested Ly-49D+ NK cells for their ability to secrete IFN-γ following receptor ligation with both mAb and H-2Dd target cells. Secretion of IFN-γ also was examined in Ly-49D+ NK cells coexpressing the inhibitory receptor Ly-49G. We also addressed the question of whether Ly-49D+ NK cells could interact with H-2Dd target cells and induce phosphorylation of murine Dap-12. Our results suggest that activation of the Ly49D pathway can augment NK cell functions other than cytotoxicity, and that target cell interaction with NK cells can lead to phosphorylation of a novel signal-associated protein, Dap-12. C57BL/6 mice were obtained from the Animal Production Area at the Frederick Cancer Research and Development Center (Frederick, MD) and used between 3 and 6 mo of age. Animal care was provided in accordance with the procedures outlined in the Guide for the Care and Use of Laboratory Animals (National Institutes of Health Publication 86-23, 1995). Groups of 20 mice were sacrificed, and the spleens were pooled to enrich for NK cells by collecting nylon wool-nonadherent cells and depleting T cells using mAb to CD4 and CD8 along with rabbit complement. The NK cells were expanded for 8–10 days in high dose IL-2 as previously described (21), then stained with FITC-4D11 plus FITC-YE1-48 along with PE-4E5 to differentiate Ly-49D+G−A− cells from Ly-49D+A+G+ cells and sorted into the appropriate subsets on a MoFlo Cell Sorter (Cytomation, Ft. Collins, CO). The YB20, YB/Dd, and YB/Db cell lines were provided by Drs. J. Ryan and M. Nakamura (University of California, San Francisco Veterans Affairs Medical Center). Yac-1 target cells and the rat myeloma cell line YB20 were cultured in RPMI 1640 and 10% FBS plus 2 mM l-glutamine, 50 μ/ml penicillin, and 50 μg/ml streptomycin. Sodium pyruvate (1 mM), nonessential amino acids, and 5 × 10−5 M 2-ME were included in the YB20 cell cultures, and G418 (1 mg/ml) was added to the YBDd and YBDb (H-2Dd/H-2Db-transfected YB20) cultured cell lines to maintain expression of class I. A 4-h 51Cr release assay was used to measure NK lysis as described previously (21). Lytic units were calculated by plotting the log of the various E:T ratios vs the percentage of 51Cr release and extrapolating the number of effector cells required to release 40% of the 51Cr incorporated into 107 target cells. Twenty-four-well plates were coated with 1–2 μg/ml of either rabbit anti-rat (Zymed, San Francisco, CA) or goat anti-mouse (Kirkegaard & Perry, Gaithersburg, MD) Abs for 3–4 h at 37°C and washed twice. In the case of co-cross-linking assays both anti-rat and anti-mouse Abs were bound to plates at a concentration of 2 μg/ml. The NK cells were pretreated with mAb at concentrations of 1 μg/106 cells in 1 ml of RPMI 1640 and 5% FBS by addition of mAb 4D11 or control mAb for 15 min on ice followed by the activating mAb for a total of 1 h. Cells were washed once with ice-cold RPMI 1640 and 5% FBS and added to 24-well plates in a total volume of 1 ml. Bulk NK cells were assayed at 1 × 106/ml, and sorted subsets were assayed at 0.5 × 106/ml. Each stimulation was performed in duplicate. Plates were incubated for 5–6 h at 37oC, and 0.5 ml of supernatant was removed for cytokine measurements, with the OD determined as an average of two readings for each sample. The IFN-γ was quantitated by ELISA (R & D Systems, Minneapolis, MN) according to the manufacturer’s specifications. With the exception of values in Fig. 1⇓B, the SDs of all cytokine measurements was <5%. A, Cross-linking Ly-49D induces IFN-γ. Bulk NK cells were harvested after expansion in IL-2 for 9 days, pretreated with the indicated mAb, and assayed for IFN-γ after cross-linking. Assays were performed in either the presence or the absence of IL-2 (500 μ/ml). Supernatants were harvested after 5–6 h at 37°C, and IFN-γ was measured by ELISA. The NK cells were phenotypically >90% positive for NK-1.1 and 2.4G2, 45% for Ly-49D+, and 50% for Ly-49G+. B, IFN-γ secretion from freshly isolated NK cells. Freshly isolated NK cells were obtained from B6 spleens by depleting the NWNAD population of CD4+ and CD8+ T cells. This population of cells was pretreated as described above with the respective mAb and assayed for IFN-γ in the absence of IL-2, except that the assay was extended for 16 h at 37°C. The phenotype of this NK cell population was 76% NK-1.1+ and 41% Ly-49D+. P/I, PMA plus ionomycin. These experiments are representative of at least three such assays performed. NK cell subsets were isolated as described above, expanded in IL-2 for 8–10 days, and added to 24-well plates at a concentration of 0.5 × 106/well. YB20 targets or their class I transfectants were added to the wells at the same concentration in a total volume of 1 ml. Plates were incubated at 37°C for 5–6 h, and supernatants were collected and measured for IFN-γ secretion. For blocking experiments F(ab′)2 mAb were added to the NK cells at a concentration of 10 μg/ml and placed on ice for 30 min before combining them with target cells, and the mAb remained in the wells for the duration of the assay. The NK cell subsets (1 × 107) were combined with YB20 target cells (1 × 107) or their class I transfectants in 1.5-ml microcentrifuge tubes in a total volume of 200 μl of RPMI 1640 and 0.5% BSA, after the NK cells had been collected, washed twice, and rested at 37°C for 1 h. Both the effectors and targets were placed on ice for 10 min before mixing. Immediately after mixing, the effector and target cells were centrifuged at 5,000 rpm in a microfuge at 4oC for 5 s, after which the pellets were either lysed immediately in ice-cold 1% Triton X-100 (0 min) or incubated at 37oC for the indicated times and then lysed for 30 min. Lysates were cleared by centrifugation for 30 min at 14,000 rpm at 4oC, followed by immunoprecipitation with protein G-Sepharose (BRL, Gaithersburg, MD) and a rabbit antiserum prepared against Ly-49D/DAP-12 immune complexes from B6 mice (TB5/60). Immune complexes were separated on 16% Tris/glycine gels (Novex, San Diego, CA) under nonreducing conditions. Proteins were transferred to Immobilon (Millipore, Bedford, MA), blotted with biotinylated 4G10 (Upstate Biotechnology, Lake Placid, NY) followed by streptavidin-HRP and exposed to Kodak Biomax film (Eastman Kodak, Rochester, NY). After inactivation of streptavidin-HRP with 15% H202, blots were exposed to a second rabbit antiserum prepared against the Dap-12 peptide (TB/20) followed by a donkey anti-rabbit HRP (Amersham, Arlington Heights, IL) to confirm the presence of Dap-12 and equal loading of the wells. The following mAb were used in these experiments: Rg2A (control rat IgG2A), 4D11 (Ly-49G; rat IgG2A), RM2-1 (CD2; rat IgGγ2), 4E5 (Ly-49D; rat IgG2A), 2.4G2 (FcγRIII; rat IgG), PK-136 (NKR-P1C; mouse IgG2A), AF6-88.5 (mouse H-2Kb; mouse IgG2A), and 5E6 (Ly-49C/I; mouse IgG2A). Previous experiments have shown that the Ly-49D+ subset of NK cells is capable of mediating reverse Ab-dependent cellular cytotoxicity of FcR+ target cells following addition of Abs that recognize Ly-49D. Perturbation of this receptor was therefore thought to induce an activating signal in NK cells that leads to cytotoxic function. Therefore, we decided to examine whether perturbation of this receptor could lead to NK cell secretion of cytokines such as IFN-γ that are associated with activation of NK cells. Fig. 1⇑A demonstrates that cross-linking of NK cell-activating receptors such as NKR-P1 and FcγRIII on murine NK cells that have been expanded in IL-2 for 8–10 days causes a rapid (6-h) induction of IFN-γ secretion (23,950 and 16,350 pg/ml, respectively). The magnitude of the response elicited by receptor cross-linking appears to be dependent on the presence of IL-2 in the assay for IFN-γ. Cross-linking of NKR-P1 and FcγRIII in the absence of IL-2 results in a significant reduction in their ability to induce secretion of IFN-γ (5,842 and 5,067 pg/ml respectively). In contrast, cross-linking of the Ly-49D receptor results in potent IFN-γ secretion in both the presence (23,650 pg/ml) and the absence (16,800 pg/ml) of IL-2. Isotype control Abs (Rg2A) or cross-linking of Ly-49G2 using mAb 4D11 did not result in enhanced IFN-γ secretion over that seen with NK cells alone. Since Ly-49G2 is an inhibitory receptor on NK cells, this finding is consistent with its proposed role in NK cell function. When considering the magnitude of the response, one must also take into consideration the fact that both NKR-P1 and FcγRIII are found on all NK cells from B6 mice, while these bulk populations of NK cells are only 50% Ly-49D+. We conclude from these data that ligation of the Ly-49D receptor transmits a potent activation signal to NK cells that results in rapid secretion of IFN-γ that does not depend on the presence of IL-2. These data suggest that ligation of Ly-49D leads to augmentation of NK cell functions other than cytotoxicity. Since the NK cells used in Fig. 1⇑A were propagated in high dose IL-2, and the presence of IL-2 appeared to affect their ability to secrete IFN-γ in response to receptor cross-linking, we assayed highly enriched populations of fresh splenic NK cells for cytokine secretion. We isolated enriched splenic NK cells from B6 mice that were approximately 75% NK-1.1+ and assayed them for IFN-γ secretion following receptor ligation (Fig. 1⇑B). It must be noted that IFN-γ assays using freshly isolated NK cells were harvested after 16 h at 37°C. 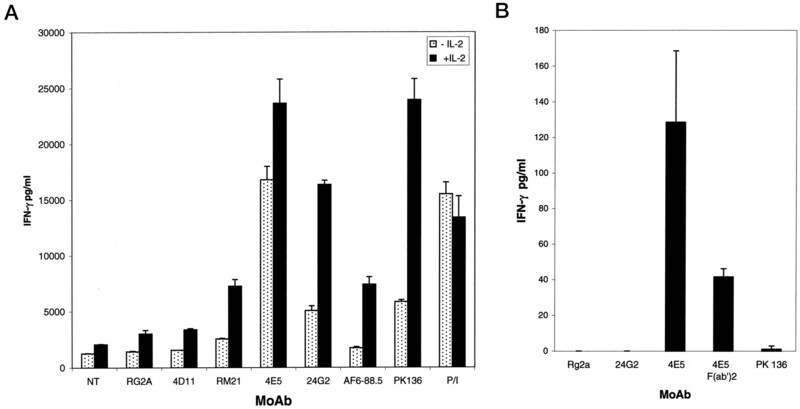 Both the intact mAb4E5 and the F(ab′)2 fragments of 4E5 increased IFN-γ secretion, although treatment with the F(ab′)2 of 4E5 induced less cytokine. We believe that this difference simply reflects the ability of the cross-linking Ab to bind to the different forms of 4E5, since it is both heavy and light chain specific. These data reveal that in NK cells, which have not been previously activated by IL-2, only the Ly-49D+ subset of NK cells can secrete IFN-γ in response to Ab cross-linking. In these experiments, Ly-49D+ NK cells represented only about 40% of freshly isolated NK cells, demonstrating that ligation of Ly-49D is a potent stimulus for IFN-γ secretion, even from NK cells that have not been previously activated. Interestingly, our results with both NKR-P1 and FcγRIII suggest that although expressed on virtually all NK cells, they cannot induce IFN-γ upon receptor ligation unless the NK cells have been previously activated with IL-2. With the observation that cross-linking of Ly-49D could induce potent IFN-γ secretion from murine NK cells, it was important to determine the relative strength of this signal in the context of Ly-49 inhibitory function. This was of particular interest for two reasons: 1) in B6 mice a large population of Ly-49D+G+ cells exists; and 2) Ly-49D and G have opposing functions, but recognize the same ligand, H-2Dd. To examine this question, NK cells were isolated from B6 spleens and sorted into either Ly-49D+G−A− or Ly-49D+G+ subsets. These subsets were expanded in IL-2 for 9–10 days, after which they were >90% positive for their respective phenotype. The NK cell subsets were pretreated with the indicated mAb and plated in an IFN-γ assay for 6 h as described previously. As shown in Fig. 2⇓A, cross-linking of Ly-49D in both the Ly-49D+G−A− and Ly-49D+G+ subsets resulted in strong IFN-γ secretion by the Ly-49D+G−A− subset (5681 pg/ml) and more moderate secretion by the Ly-49D+G+ cells (1637 pg/ml). A similar pattern was seen after cross-linking NKR-P1 and FcγRIII on these subsets. 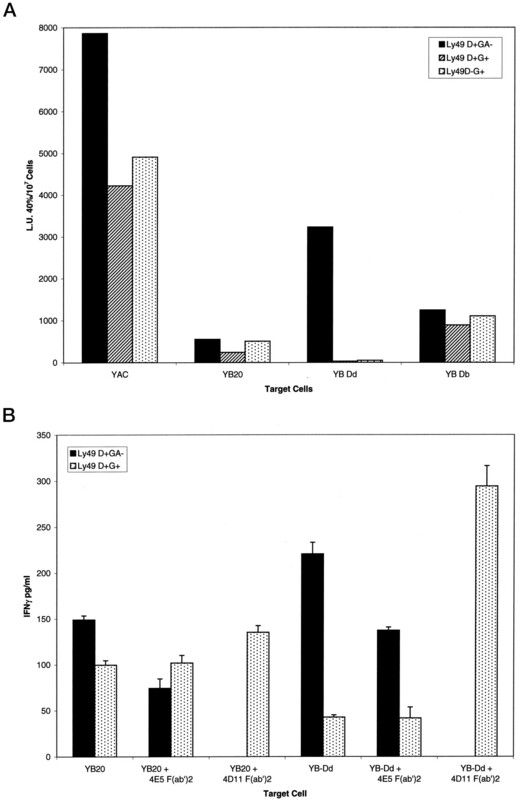 Ly-49D+G−A− cells yielded 1001 pg/ml compared with 244 pg/ml in the Ly-49D+G+ cells after NKR-P1 cross-linking, and FcγRIII cross-linking yielded 2147 and 286 pg/ml in the respective subsets. Here we demonstrate that all three NK cell activating receptors respond to cross-linking better in the Ly-49D+G−A− subset than in the Ly-49D+G+ cells with respect to IFN-γ secretion. Our findings suggest that the mere presence of the Ly-49G inhibitory receptor on an NK cell may be enough to interfere with optimal secretion of IFN-γ upon ligation of an activating receptor. A, IFN-γ secretion from Ly-49D+G−A− and Ly-49D+G+ subsets. Enriched B6 splenic NK cells were sorted into subsets containing Ly-49D+G−A− and Ly-49D+G+ cells by flow cytometry and were grown for 10 days in IL-2. These subsets were found to be >90% positive for their respective phenotype on day 10. The NK cell subsets were tested for IFN-γ secretion following pretreatment with mAb and cross-linking as described above. B, Cross-linking Ly-49G inhibits receptor-mediated IFN-γ secretion. The NK cell subsets were first treated with mAb 4D11 or control Ab to class I (AF6-88.5), followed by 2.4G2, PK-136, or 4E5. Subsets were then assayed for IFN-γ following receptor cross-linking in the absence of IL-2. The above experiments have been repeated at least three times. Although Ly-49D+G+ NK cells produced less IFN-γ compared with the Ly-49D+G−A− subset regardless of which activating NK receptors were cross-linked, we examined cross-linking of Ly-49G for its ability to further inhibit secretion of IFN-γ following cross-linking of both activating and inhibitory receptors. Fig. 2⇑B presents the data on the inhibition of IFN-γ secretion following simultaneous cross-linking of the activating NK cell receptors and the inhibitory receptor, Ly-49G. Cross-linking of both Ly-49D and Ly-49G on the Ly-49D+G+ subset of NK cells resulted in decreased amounts of IFN-γ secreted (2152 pg/ml) compared with that seen after cross-linking of Ly-49D alone (4816 pg/ml). Since both the 4D11 (Ly-49G) and 4E5 (Ly-49D) mAb are of the same isotype (rat IgG2a), recognition of these mAb by the cross-linking Ab should be equivalent. Furthermore, since the cross-linking Ab was bound to plastic and the NK cells were precoated with receptor mAb, competition for the cross-linking Ab would appear unlikely. However, additional controls shown in Fig. 2⇑B demonstrate that pretreatment of Ly-49D+G+ cells with Abs to both H-2Kb and Ly-49D, FcγRII, or NKR-P1C followed by cross-linking resulted in no decrease in IFN-γ secretion compared with cross-linking of the activating receptors alone. F(ab′)2 cross-linking Abs were used in these experiments to address concerns about Fc receptor interaction with NK cells. These findings are significant and support previous studies showing that the engagement of inhibitory Ly-49 receptors down-regulates activating signals in NK cells (22). Fig. 2⇑B also demonstrates that simultaneous cross-linking of inhibitory Ly-49G along with activating NKR-P1 and FcγRIII results in inhibition of IFN-γ secretion by the Ly-49D+G+ cells. Therefore, not only can inhibitory Ly-49 receptors suppress NK lytic function, but they also can inhibit other activation-related events, such as IFN-γ secretion by NK cells, which may be important in regulating immune responses in vivo. The results of our cross-linking studies with Ly-49D+ NK cells proved that perturbation of this receptor could result in cytokine secretion and provided further evidence that Ly-49D mediates activation events. Evidence has been presented suggesting that Ly-49D+ NK cells may recognize the class I glycoprotein H-2Dd (18, 19, 20). Therefore, we tested the potential of Ly-49D+ NK cells to preferentially lyse H-2Dd transfected target cells. Since Ly-49A and Ly-49G are inhibitory receptors and also recognize class I/H-2Dd as ligand, NK cells were sorted into subsets that were Ly-49D+G−A−, Ly-49D+G+, or Ly-49G+D− and cultured for 8–10 days in IL-2. These subsets were tested in a 4-h 51Cr release assay against Yac-1, parental YB20 target cells (rat B cell line), or YB20 cells stably transfected with H-2Dd (YB/Dd) or H-2Db (YB/Db). The results shown in Fig. 3⇓A confirm the ability of the Ly-49D+G−A− cells to lyse YB/Dd transfected targets much more effectively than either the parental YB20 cells or the YB/Db transfectants. However, neither the Ly-49D+G+ subset of NK cells nor the Ly-49D−G+ subset of NK cells lysed the YB/Dd cells, consistent with a dominant inhibitory function of Ly-49G in the presence of its H-2Dd ligand. Importantly, all NK subsets lysed Yac-1 targets very well, although the subsets expressing the Ly-49G receptor did so to a somewhat lesser degree, consistent with Yac-1’s weak expression of H-2Dd. An alternate explanation is that the mere presence of the Ly-49G inhibitory receptor may suppress activation signals in this subset of NK cells. Furthermore, theories suggesting that inhibitory receptors function only in the presence of an activating receptor for the same ligand may be incorrect, since Ly-49G+D− NK cells do not lyse YB/Dd target cells, indicating an intact inhibitory function for Ly-49G in the absence of Ly-49D. A, Ly-49D/H-2Dd target cell interactions augment cytotoxicity and IFN-γ production. The NK cells were sorted into Ly-49D+G−A−, Ly-49D+G+, and Ly-49G+D− subsets and grown for 10 days in IL-2. These subsets were examined for their ability to lyse Yac-1, YB20, YB/Db, or YBDd targets in a 4-h 51Cr release assay at ratios starting at 20:1. The results are expressed as lytic units per 107 cells at 40% lysis. The respective phenotype of the NK subsets was >90% at the time of testing. The class I expression of the YB20 transfectants was also confirmed on the day of the assay. B, The NK cells isolated as described in A were admixed with YB20 target cells or their class I transfectants, and supernatants were measured for IFN-γ secretion after incubation at 37°C for 6 h. F(ab)′2 of either 4D11 or 4E5 were used to pretreat the indicated NK cell subsets for 30 min on ice at a concentration of 10 μg/ml. The Abs remained in the assay for IFN-γ for the length of the assay. Incubation of YB20 target cells with PMA/ionomycin did not induce the secretion of IFN-γ. The above experiments are representative of three such assays performed. Since NK cell secretion of IFN-γ may be as important as their ability to lyse target cells, we examined the ability of Ly-49D+ NK cells to secrete this cytokine in response to target cells expressing H-2Dd. When the Ly-49D+G−A− and Ly-49D+G+ subsets were combined with the parental YB20 target cells or their class I-transfected counterparts (23) and tested for their ability to secrete IFN-γ, we obtained a pattern similar to that seen with lysis. An important control in these experiments was that YB2O cells did not produce IFN-γ in response to PMA and ionomycin alone. Fig. 3⇑B demonstrates that coincubation of the YB/Dd cells with Ly-49D+G−A− NK cells resulted in enhanced levels of IFN-γ (221 pg/ml) compared with the parental YB20 cells (149 pg/ml). However, Ly-49D+G+ NK cells did not respond to the H-2Dd transfectants, consistent with the dominant inhibitory function of the Ly-49G receptor. Fig. 3⇑B also demonstrates the specificity of the Ly-49D and Ly-49G target cell responses through the addition of mAb4E5 and 4D11 F(ab′)2 in the assays. 4E5 F(ab′)2 block the Ly-49D/H-2Dd interaction and prevent the secretion of IFN-γ from the Ly-49D+G−A− subset of NK cells. While 4E5F(ab′)2 blocked all the H-2Dd-induced IFN-γ production by the Ly-49D+G−A− cells, it also reduced IFN-γ secretion by the Ly-49D+G−A− cells in the presence of the parental YB20 cells. These results suggest that Ly-49D+ cells may recognize an allogeneic ligand on parental YB2O cells to some degree. Although this finding has been reproducible with 4E5, additional experiments with mAb 12A8 F(ab′)2 (Ly-49A and -D specific) treatment of Ly-49D+G−A− cells does not result in reduced IFN-γ in the presence of YB2O target cells, but effectively blocked IFN-γ secretion against the YB/Dd targets (data not shown). In contrast, as shown in Fig. 3⇑B, the 4D11 F(ab′)2 prevents the inhibitory Ly-49G/H-2Dd interactions from occurring and allows IFN-γ secretion by the Ly-49D+G+ cells. Although not included in this experiment, other experiments have shown that 4D11F(ab′)2 did not affect the amount of IFN-γ produced by Ly-49D+G− NK cells when in contact with YB2O targets (data not shown). These data provide further evidence to support the finding that H-2Dd is a ligand for Ly-49D, and that activation through this receptor results in downstream signals that are not restricted to the lytic mechanism of NK cells. Furthermore, when NK cells coexpress both an inhibitory and an activating Ly-49 receptor that recognize the same class I ligand, the inhibitory function appears to turn off not only lytic events in NK cells, but cytokine secretion as well. Target cell recognition by murine NK cells has not been well characterized in terms of the biochemical events that transmit activation signals resulting in the “lytic hit.” We have previously demonstrated that Dap-12 associates with Ly-49D and is phosphorylated upon receptor cross-linking (16). As H-2Dd appears to be a ligand for Ly-49D, we examined effector/target cell interactions for their potential to induce phosphorylation of Dap-12. The NK cells were sorted into subsets that contained Ly-49D+G−A− or Ly-49D+G+ cells and cultured in IL-2 for 8–10 days. 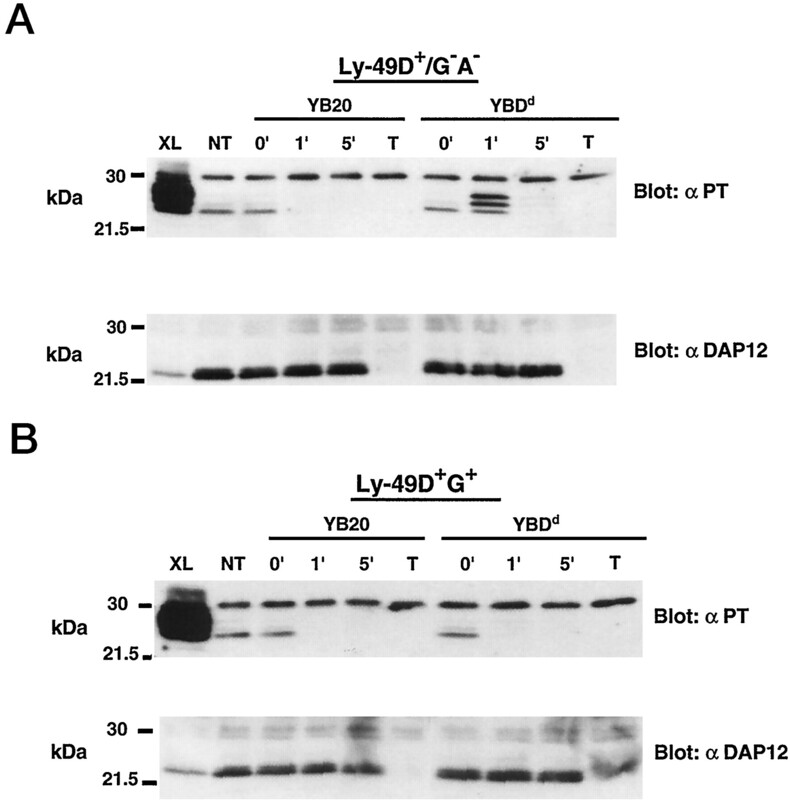 Both the Ly-49D+G−A− and Ly-49D+G+ subsets were allowed to interact with either the parental YB20 targets or their class I-transfected counterparts YB/Dd and were examined for Dap-12 phosphorylation. Fig. 4⇓A demonstrates that when Ly-49D+G−A− NK cells are combined with YB/Dd targets, phosphorylation of Ly-49D-associated Dap-12 can be demonstrated with our rabbit antisera (TB5/60) and occurs within 1 min of incubation at 37°C. Phosphorylated DAP-12 appears as a ladder-like series of bands similar to but not as strong as Ab-mediated cross-linking of Ly-49D. However, phosphorylation of Dap-12 is transient and no longer seen after 5 min of incubation at 37°C. The kinetics of effector/target cell Dap-12 phosphorylation are similar to those seen following receptor cross-linking using mAb (16, 17). The specificity of this interaction is demonstrated by the fact that no phosphorylation of Dap-12 is seen when Ly-49D+G−A− cells are combined with the parental YB20 target cells. These results demonstrate for the first time that interaction of a specific Ly-49-activating receptor (Ly-49D) with its class I target cell ligand results in a biochemical signaling event in NK cells (Dap-12 phosphorylation). It must be noted that attempts to demonstrate Dap-12 phosphorylation upon immunoprecipitating Ly-49D using mAb 4E5 were unsuccessful. YB/Dd-NK cell interactions probably engage a limited number of Ly-49D receptors that are below the sensitivity levels of these assays using this mAb. As Fig. 4⇓A demonstrates, although we can detect phosphorylated Dap-12 after 1-min incubation using the highly sensitive mAb 4G10, there is no observable decrease in basal (nonphosphorylated) levels of Dap-12, as shown by immunoblotting with antisera to the Dap-12 peptide. This blotting antisera to Dap-12 only detects nonphosphorylated Dap-12. These results suggest that only very small amounts of total Dap-12 actually get phosphorylated under these conditions. However, Fig. 4⇓B provides additional information concerning the function of Ly-49 inhibitory receptors. NK cells expressing both Ly-49G and -D do not phosphorylate Dap-12 in response to target cells expressing H-2Dd. Therefore, engagement of class I by inhibitory Ly-49 receptors appears to inhibit Dap-12 phosphorylation, probably through recruitment of the phosphatase SHP-1. However, Ly-49D on the Ly-49D+G+ subset of NK cells can, in fact, respond to stimulation, as shown by phosphorylation of Dap-12 following receptor cross-linking with mAb 4E5. Blotting for Dap-12 revealed that all lanes contained equal amounts of Dap-12, except where NK cells were cross-linked. These samples only contained 0.5 × 106 cells compared with the effector/target lanes containing 10 × 106 NK cells. Therefore, for the first time we show that a specific murine NK cell receptor (Ly-49D) is involved in E:T interactions that lead to tyrosine phosphorylation of the unique signaling chain, Dap-12. A, Ly-49D+ NK cells phosphorylate Dap-12 in response to H-2Dd targets. NK cells were sorted into Ly-49D+G−A− and Ly-49D+G+ subsets and expanded in IL-2 for 10 days. After incubation of the NK cells with either YB20 or YBDd targets at a ratio of 1:1 on ice for 10 min, they were pelleted briefly at 4°C and incubated at 37°C as indicated. Lysates were immunoprecipitated with antisera to Ly-49D/Dap-12, and blots were performed with biotinylated 4G10 followed by antisera to Dap-12. B, Identical assays were performed using the Ly-49D+G+ subset of NK cells. XL, cross-linking with 4E5 plus rabbit anti- rat Ab; T, targets only; NT, no treatment. A representative experiment is shown. Cloning and sequencing of the cDNA for Ly-49D revealed that it did not contain the consensus ITIM found within the cytoplasmic domains of the inhibitory Ly-49s (8). Further study revealed that in the presence of mAb 12A8, Ly-49D+ NK cells could mediate Ab-dependent cellular cytotoxicity of FcR+ target cells (reverse ADCC), consistent with its role as an activation receptor (15). Recent data reported by Raziuddin et al. (18), Nakamura et al. (19), and George et al. (20) demonstrate that Ly-49D+ NK cells recognize target cells expressing H-2Dd, leading to enhanced target cell lysis. Furthermore, recent studies by our group (16), Lanier et al. (4, 24), and Olcese et al. (25) have identified a novel activation-related signal-transducing chain, Dap-12, that physically and functionally associates with Ly-49D and -H as well as the human KARs. Dap-12 may be the first signal moiety identified that is confined to cells of the innate immune system, since it appears to be restricted to NK cells and cells of myelocytic lineage (4). Signaling studies with Ly-49D revealed that cross-linking this receptor with mAb induces phosphorylation of Dap-12, Syk, and other downstream substrates (17), consistent with an activation repertoire. NK cell function is not confined to cytolytic events, as they also are important mediators of cytokine secretion (26). We have previously demonstrated that Ly-49A and -G can regulate cytokine production by NK cells (27) and NK-1.1+ T cells (28) in the presence of selected target cells. Therefore, we examined the activation receptor Ly-49D for its ability to trigger NK cells to secrete cytokines following receptor cross-linking with mAb and after engagement with class I-expressing target cells. Furthermore, since no data have been published in the murine system on the activation of specific signal-associated events following NK cell/target cell interactions, we examined Ly-49D+ NK cells for phosphorylation of Dap-12. Our results demonstrate that Ly-49D+ NK cell/H-2Dd target cell interactions can mediate cytokine secretion, enhanced levels of cytotoxicity, and phosphorylation of Dap-12 in NK cells, suggesting a physiologically relevant role for this receptor/ligand complex in vivo. The potential activating receptors on murine NK cells include NKR-P1, FcγRIII, Ly-49D and -H, CD69, CD2, and possibly NKG2D. However, little is known about the signaling events that occur following ligation of most of these receptors or the actual ligands with which they interact. In the human system, some data exist suggesting that signaling NK cells through the FcR is distinct from signaling following NK cell/target cell interactions involved with natural killing (29). These authors also demonstrated that phosphorylation of Syk is an early and important activation event for the development of natural cytotoxicity against a variety of tumor targets (29). Bonnema et al. (30) have demonstrated that FcR stimulation triggers phosphatidylinositol 3-kinase activation, leading to granule release and ADCC, and have suggested that ADCC and natural killing use different signaling pathways. It also has been demonstrated in the human system that KIR ligation inhibits FcR-induced tyrosine phosphorylation of TCR-ζ, ZAP-70, and phospholipase Cγ1 (31). In the mouse system, cross-linking NKR-P1 has previously been shown to enhance the proliferation of murine NK cells and their ability to secrete IFN-γ in long term (48-h) assays (32). However, there are no data in the murine system on the biochemical events mediated upon engagement of specific Ly-49-activating receptors with their proposed cellular class I ligands. Receptor phosphorylation of the inhibitory Ly-49A and G molecules, and recruitment of the phosphatase SHP-1 following their ligation are the only Ly-49-related biochemical signaling events demonstrated to occur in murine NK cells (33, 34). Receptor ligation of activation molecules on NK cells may not only be important for the induction of their cytolytic function, but may also control the ability of these cells to secrete cytokines. As NK cells are potent producers of IFN-γ (35) and inhibit viral replication of LCMV in an IFN-γ-dependent manner (36), the biochemical signaling events regulating cytokine secretion may also be controlled by Ly-49-activating receptors. In this report we demonstrate that perturbation of the Ly-49D receptor not only enhances the lytic function of NK cells, but also augments their ability to secrete cytokines, in particular IFN-γ, following receptor ligation with mAb. We also have determined that cross-linking of Ly-49D can lead to secretion of TNF-α, albeit at much lower levels than seen for IFN-γ (data not shown). The Ly-49D-mediated cytokine response is very rapid and potent, and it appears that NK cells do not have to be activated for this response to occur. However, in our hands IFN-γ production following NKR-P1 and FcγRIII ligation appears to require prior culture of NK cells in IL-2. We also demonstrate that IFN-γ secretion can be suppressed when both Ly-49 inhibitory receptors (G) and activating receptors (D) are simultaneously cross-linked on NK cells. A consistent finding in our assays was that the level of IFN-γ secretion achieved after Ab cross-linking of Ly-49D in Ly-49D+G+ cells compared with Ly-49D+G− cells was always significantly lower. However, previous studies on Ab-mediated cross-linking of Ly-49G had revealed a constitutive level of Ly-49G phosphorylation before stimulation (34). This basal level of phosphorylation, if accompanied by the SHP-1 phosphatase, may explain the lower levels of IFN-γ elicited from Ly-49D+G+ cells following receptor cross-linking. Although enhanced lysis of target cells expressing the class I molecule H-2Dd has already been demonstrated for Ly-49D+ NK cells (19, 20), we demonstrate here that target cells expressing H-2Dd also can trigger Ly-49D+ cells to secrete IFN-γ. Consistent with our Ab cross-linking studies, coexpression of both Ly-49G and -D on NK cells results in a diminished IFN-γ response when combined with target cells expressing the H-2Dd ligand specific for these receptors. It has been proposed that activating receptors may be involved in triggering the kinases that ultimately phosphorylate the inhibitory receptors (37). Our results with the Ly-49G+/D− subset of NK cells does not support this hypothesis, since these cells did not lyse target cells expressing H-2Dd, indicating a functional inhibitory signaling cascade. This subset of NK cells expressed an inhibitory receptor for H-2Dd, but did not express the known activating receptor for this class I protein, Ly-49D. Of course we cannot rule out the possibility that these cells express other activating receptors that recognize H-2Dd. A second major finding of the current study is that effector/target cell interactions involving Ly-49D+ NK cells and target cells expressing H-2Dd result in phosphorylation of the signal-associating molecule Dap-12. This is the first reported demonstration of a positive biochemical signaling event involving a Ly-49-activating receptor and its class I ligand on a target cell. An important control in these assays is the failure of NK cells expressing both Ly-49D and Ly-49G to signal through Dap-12 following recognition of their common class I ligand. In this instance the engagement of the inhibitory Ly-49G by H-2Dd apparently prevents phosphorylation of Dap-12, probably through recruitment of SHP-1. Therefore, NK cells expressing both Ly-49-activating and inhibitory receptors for a given MHC class I are most likely turned off. Although the role played by Ly-49-activating receptors in NK cells is not understood at present, if their physiological ligands are host class I molecules, down-regulation of the NK lytic response would seem to be the preferred outcome. However, it is not inconceivable that some pathogenic alteration in peptide presentation, glycosylation, or expression of selected class I molecules may be required for optimal recognition by these activation receptors, resulting in destruction of the infected host cell. We thank Mr. Gordon Wiegand for his excellent cell sorting efforts and Dr. Steve Anderson for critically reviewing the manuscript. ↵1 The content of this publication does not necessarily reflect the views or policies of the Department of Health and Human Services, nor does mention of trade names, commercial products, or organizations imply endorsement by the U.S. Government. ↵3 Abbreviations used in this paper: KIR, killer cell inhibitory receptor; KAR, killer cell-activating receptor; ITIM, immunoreceptor tyrosine inhibitory motif; SHP, Src homology protein; ADCC, Ab-dependent cellular cytotoxicity.